M&M Cookie Bars in a Jar are a great gift for any holiday or occasion, just change the colors of the M&M’s to represent the holiday. I don’t like receiving a lot of gifts because I’m trying to declutter and not collect more things, so I love food gifts. Who doesn’t? 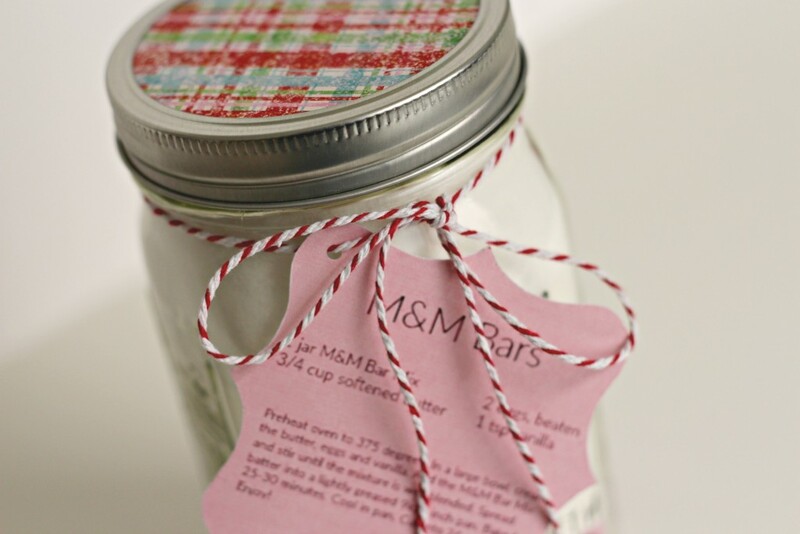 M&M Cookie Bars in a Jar makes a great neighbor, thank you, coach, or just any time gift. It’s a super easy gift to customize using holiday colored M&M’s. 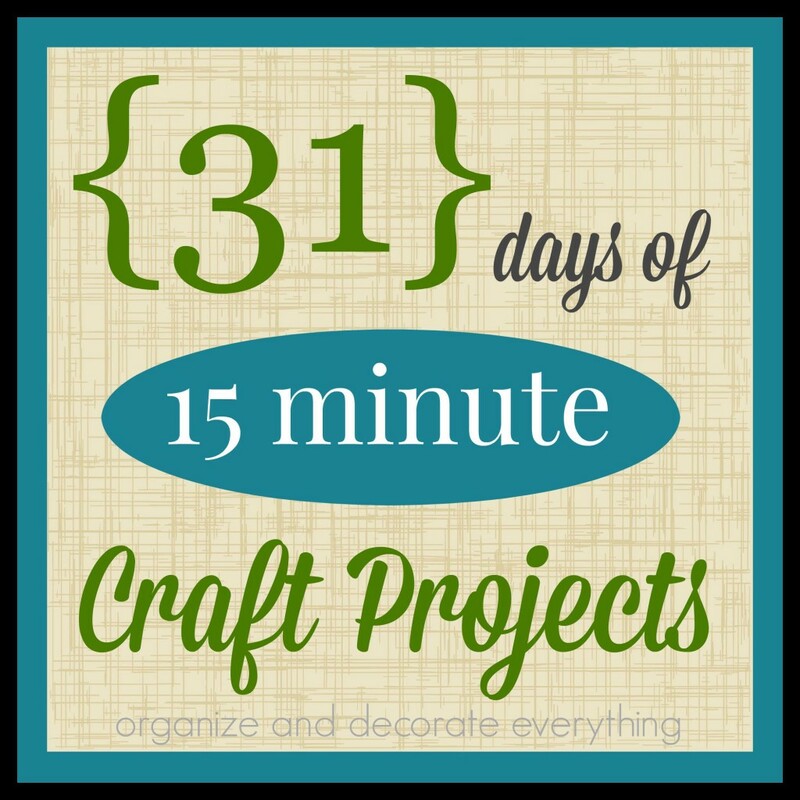 I like a gift idea that’s easy to give for another event or holiday just by changing it up a bit. Layer ingredients in a wide mouth mason jar in the order given. 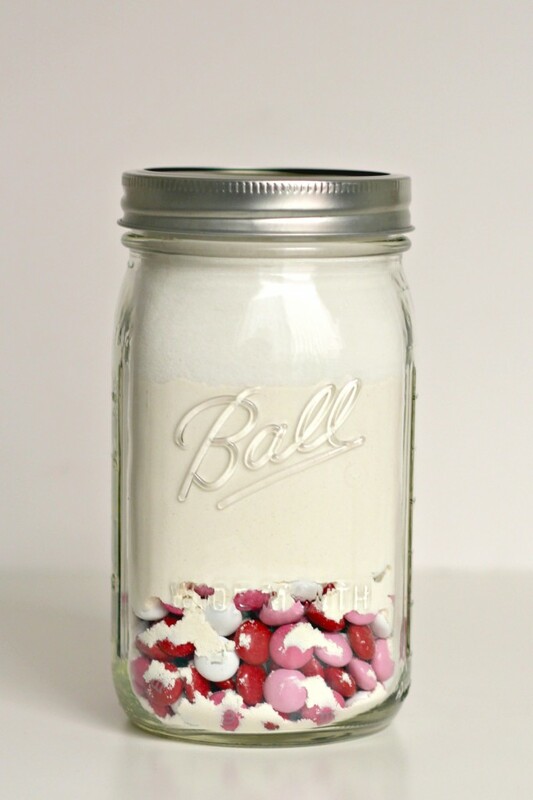 To get all the ingredients to fit in the jar you need to push each layer down. I used the back of a spoon. It’s a tight fit for everything. You can see the layers in this photo if you look closely. I decorated the lid using a piece of scrapbook paper. Trace the lid to get the correct size then cut it out. Place it on top of the lid in the jar ring. 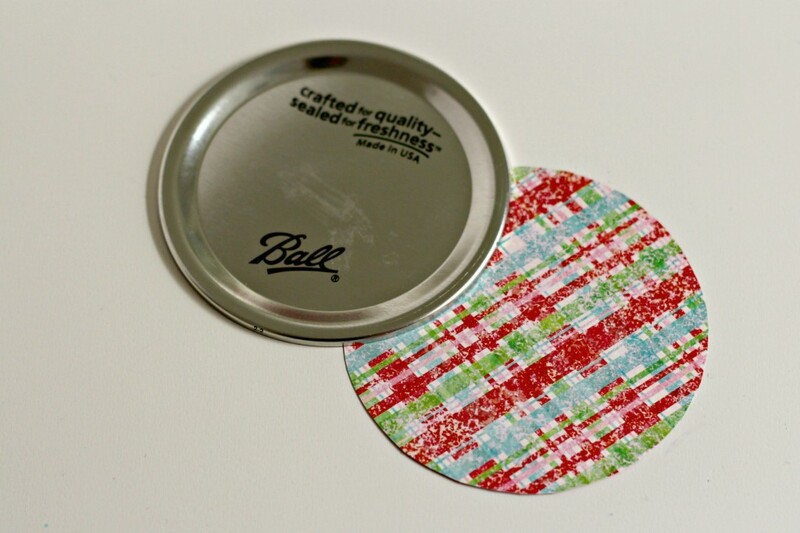 You can also use fabric, washi tape, or paint to decorate the lid. 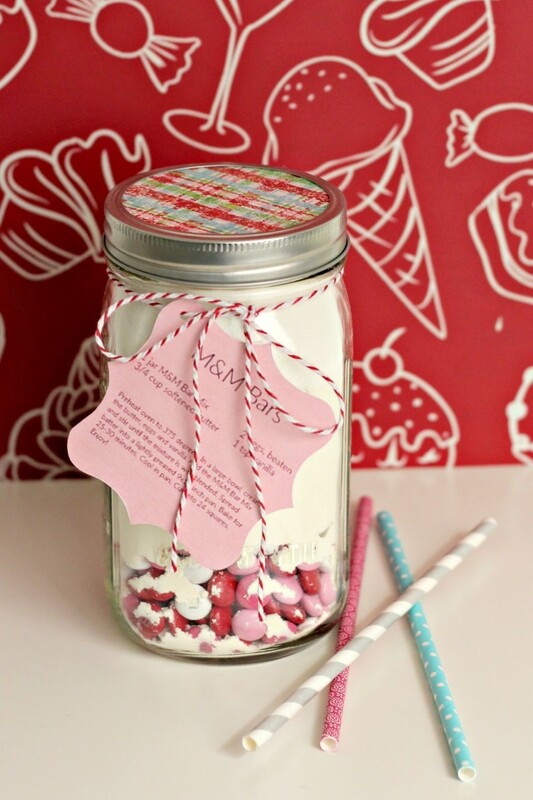 You will need bakers twine or some other type of string and the recipe tag to attach to the gift jar. Cut out the tag in the color you like, there are 6 to choose from. 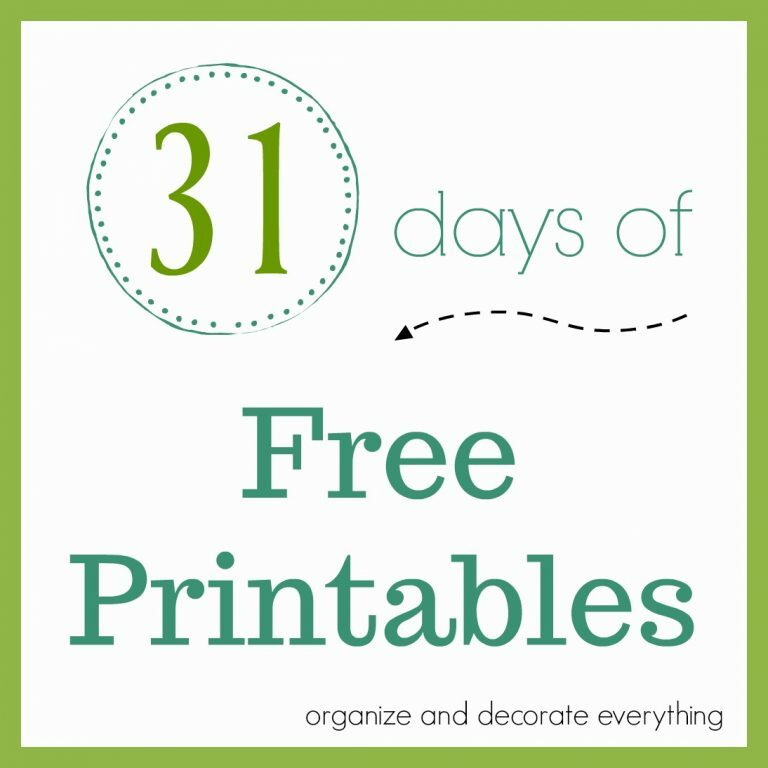 Click here to print out the Recipe Tags. 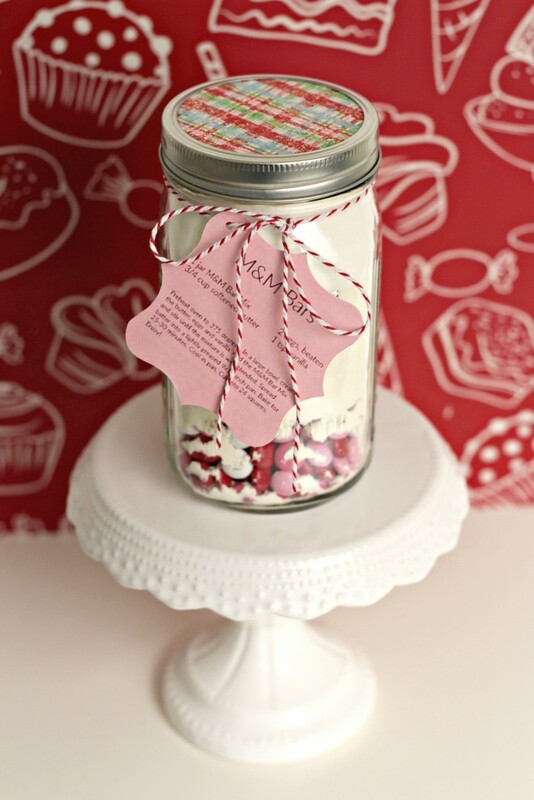 The mixing and baking directions are on the tags so you’ll want to have them attached to the jars. I just noticed that the tags look like pretty Easter egg colors when they’re all together. 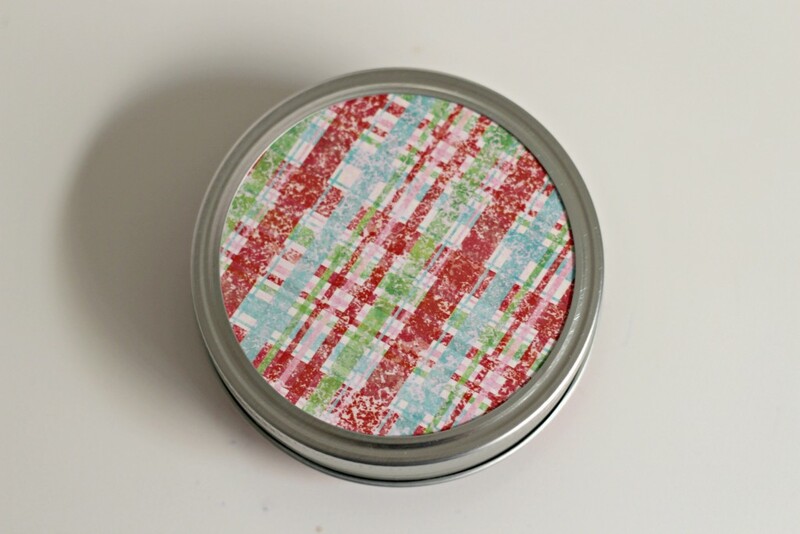 Punch a small hole in the tag and attach it to the jar using bakers twine. 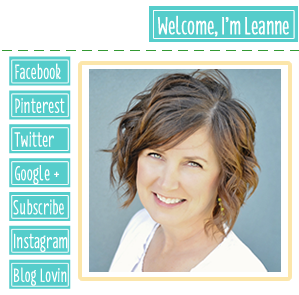 You can also write a message on the back of the tag if you like. 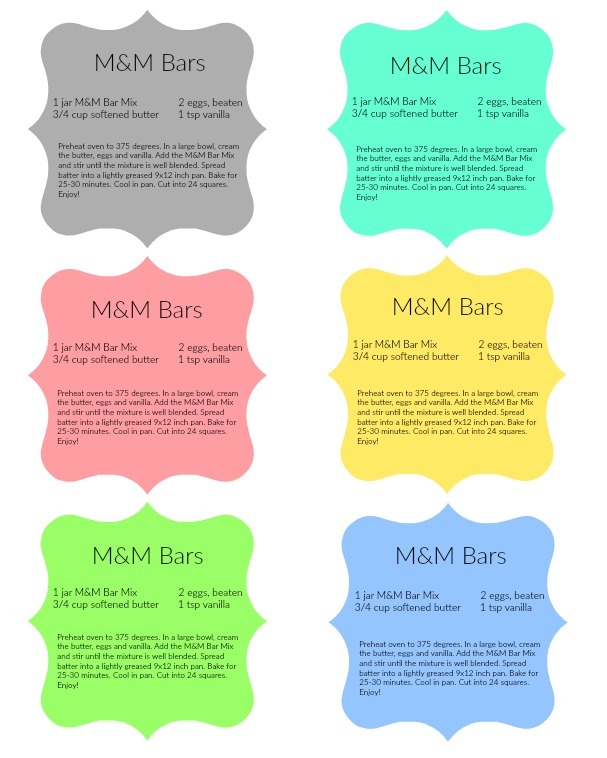 The M&M Cookie Bar mix should keep up to 6 months if kept closed until ready to use. I don’t think you’re going to have a problem with it being around longer than 6 months, it would be lucky to make it 60 minutes in my house. 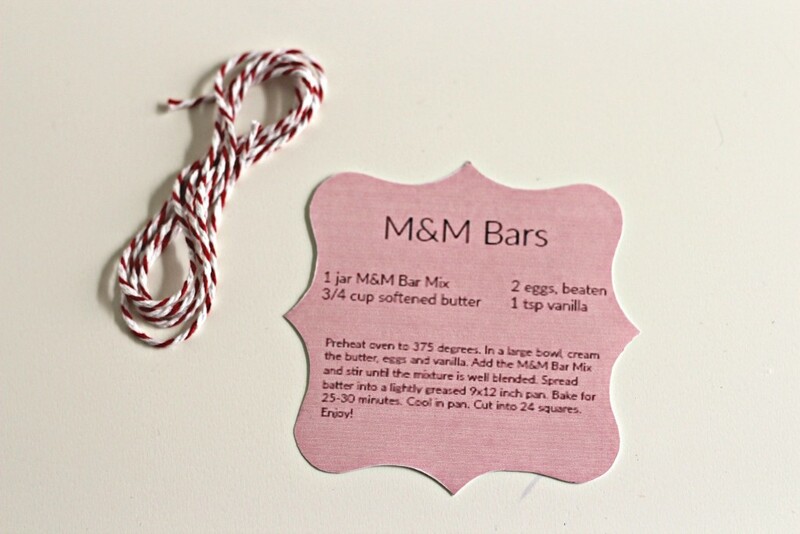 The Cookie Bar mixes can be easily adapted to any holiday by changing the color of the M&M’s, lid, and gift tags. 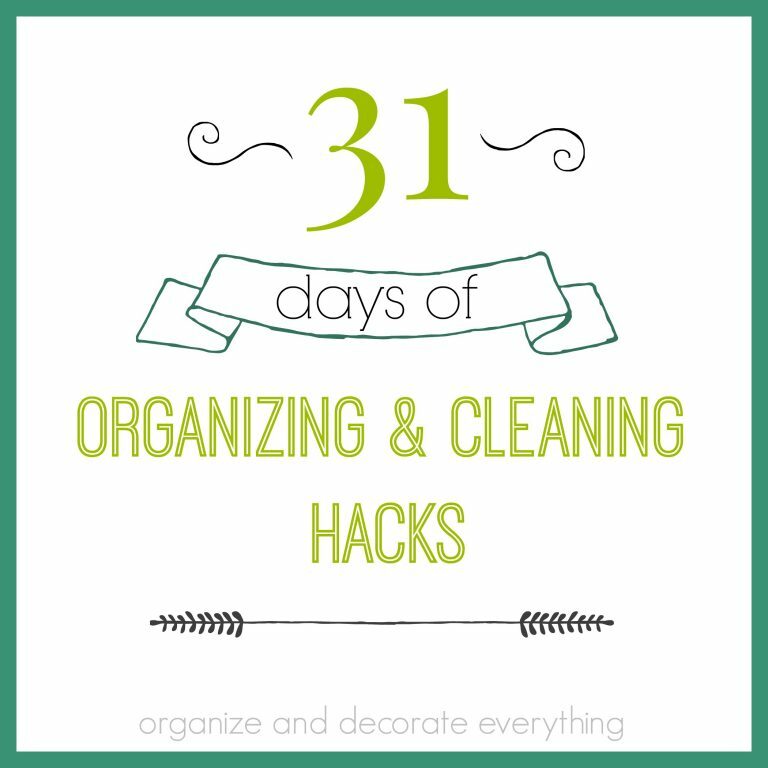 You can print out as many of the tags as you need to use. 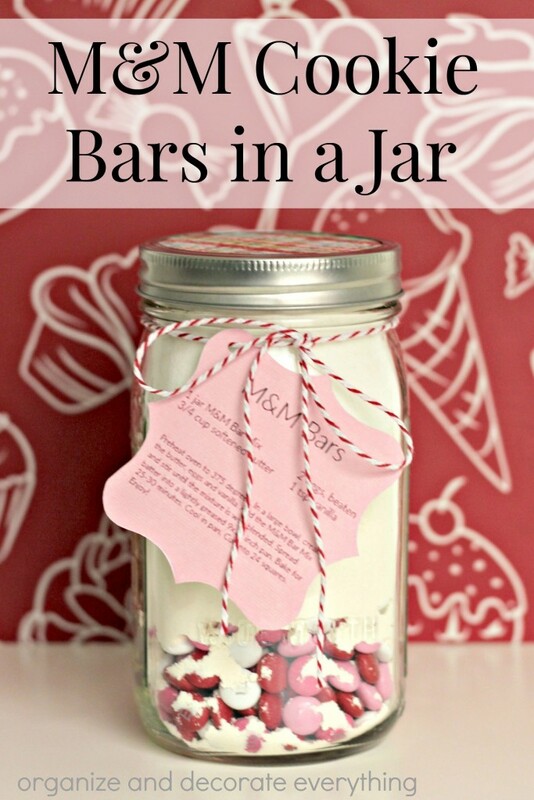 You’ll be the favorite person in the neighbor if you give these jars out for holidays or just because. Now I think it’s time to make some Cookie Bars.